Earth has almost completed a full circuit around the sun since I began my Charles Wright journey on July 1, 2016. As I lean back, close my eyes and review the year in my mind’s eye, images of joy and fun and challenge, of laughter and tears and skinned knees, and of focus and intensity and curiosity are a steady staccato burst that bring a smile to my face. 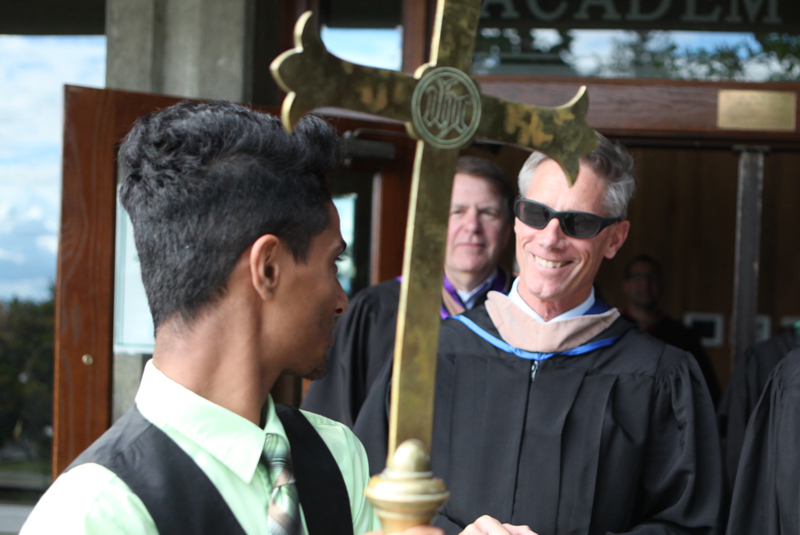 From my early meetings last summer with faculty and staff where I quickly came to appreciate their love and commitment to the students and the school—and my standing at the school gate with Spike on opening day—to the poignant essay on community shared by a senior at Baccalaureate service, my excitement and appreciation of being part of this community has steadily grown over the year. Football games, fireside chats, sophomore backpacking, watershed studies, cross-country races, the college fair, the NWAIS Educators Conference, rain, musical performances, Ultimate, exams, Author’s Teas, the Shakespeare Festival, Winterim adventures, rain, Founders’ Day, pub night QandAs, soccer, Arts Night, senior internships, tennis, final exams, Baccalaureate, the moving-on ceremony, commencement… breathe. Breathe. Breathe. The school year at Charles Wright has been like a huge building wave that curls over crashing, splashing, and spreading across the beach as students and teachers spend the year exploring the life of the mind reading books, doing research, performing art, experiencing the world, and developing relationships. As I looked at the sea of faces at our commencement ceremony, awash in joy and support, I listened to the faculty and student speakers. What I heard and saw demonstrated in the diploma awarding by a faculty member to each student was the intimacy and power of the relational experience built on learning. This allows each Charles Wright student to safely and successfully take risks and grow and to come to know themselves through the experience of learning with others. I am proud to be part of this generous and caring community, one that is filled with learners of different needs and interests, and guided by faculty of different talents and interests—but all of whom care deeply that we understand the world and the human condition. And this is so for our diverse family of Charles Wright learners and teachers. Thank you for your welcome to this community.